The new 2018 Deuter Futura Vario 50 + 10 pack is available on the market, so this great pack has been improved and there are some important changes in the design. 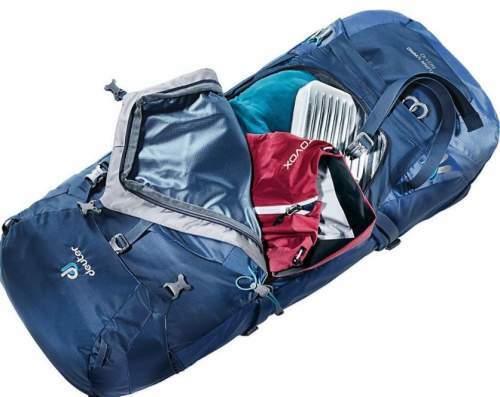 The pack is lighter and it comes with bottom compression straps. The new Futura Vario 50 – front view. Aircomfort suspension system with a tensioned mesh. Vari Flex hip belt system. Vari Slide torso length adjustment system. 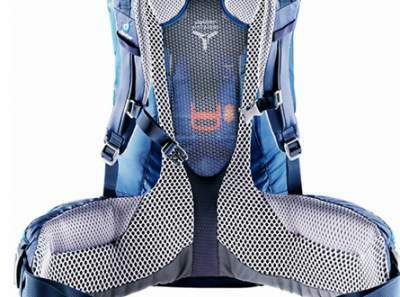 There is a new front stretch mesh pocket in the New Futura Vario. The previous version was with a zippered front pocket. I am not sure which is better, obviously both have pros and cons. I would probably rather have the previous zippered pocket. 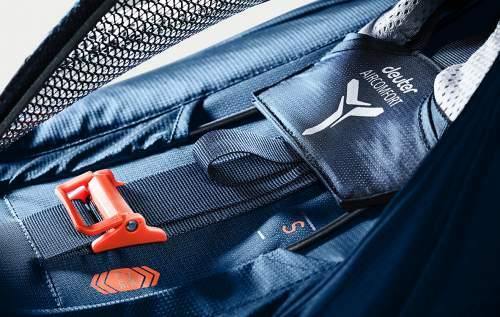 The stretch mesh front pocket on the new Futura Vario 50. The zippered front pocket on the previous pack. The previous straps with buckles, which were there only to secure the flap covering the front entrance zipper, are repositioned and extended. In this way, they can accommodate a sleeping pad. I asked the Deuter and they confirmed such a purpose of the new straps. The new Futura Vario 50 bottom straps. The previous Futura Vario 50 straps. The new pack with its hip belt and lumbar padding. This is the previous version. It is important to stress that this is again the trampoline type tensioned mesh which Deuter introduced in 1984. Nowadays, many brands are introducing this system in small to medium size packs. I am convinced there is nothing better. I have been using this system since 2003 when I purchased my first Futura 38. The side pockets are more angled now so that you can easier put the bottle in, this is also an improvement. The new version is lighter; you have 4.56 lb (2.07 kg). The previous version was 4.94 lb (2.24 kg). This part is mainly for those who were not familiar with this series and with the previous version, so here are all the features of this great pack. 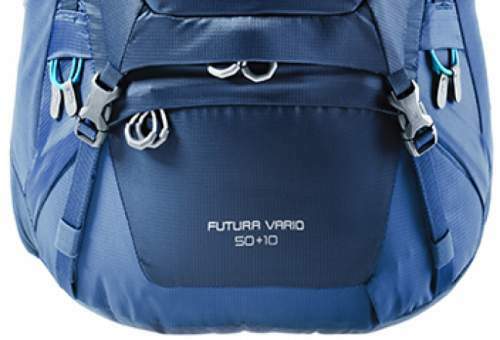 The Futura Vario 50 + 10 is a pack with three access points to the main compartment: from the top under the lid, from the front, and from the bottom. The front access to the main compartment. The bottom access is through the sleeping bag compartment. There is a real divider here between the two compartments, it is with a zipper so it closes the space completely, unlike some other packs where you can see only some shelf with toggles. When you unzip the divider you can access the pack from this side as well, and you can use the whole space as a single compartment. The pack is hydration compatible and you have a sleeve in the main compartment where you can store a 3-liter water bladder (not included). You have already seen a bit of it, here to add a few more details. The suspension is based on a permanently elastic, break-proof inverted-U shaped spring steel piece. This is a lightweight but ergonomic structure which i) transfers the load to the hip belt, and ii) it also creates tension in the back mesh. This mesh keeps the pack completely separated from the back and you have the maximum possible airflow in all directions. This is their Aircomfort system – there is nothing better regarding ventilation, but there are many packs nowadays with such a system or with some variant of it. You can see it in the Gregory Zulu and Gregory Optic packs, but also in the Osprey Aether AG 60, Osprey Eja 58, and in Osprey Sirus and Stratos packs. The pack is also with what they call the ActiveFit shoulder straps system which fits comfortably to any shoulder width through its self-acting adjustment. When the new version was announced last year and I still did not have an access to it, I asked them about it and got the answer that this includes a flexible attachment to the backpack which allows the shoulder harness to adjust in every direction, offering a wider range of fit. In other words, the shoulder straps adapt automatically to the body. The torso length is adjustable and this is what they call Vari Slide System, see the picture below. This practically means that you can have any torso length in the range 15 – 22 inches (38 – 56 cm), so this is not a ladder type system with discrete positions which you have in some packs. You also have load-lifter straps in place and the sternum strap, both designed for fine tuning and for a perfect fit. The shoulder straps are S-shaped and ergonomic, with a great padding, and the hip belt is with its redesigned dual density foam. This they describe as the Variflex ECL (Ergonomic Comfort Lock) design. It fits to the hips and distributes the weight comfortably due to its ergonomic profile and a gap-free transition from the back system; so this is quite different from the previous version. Here you also have the pivoting system and this implies that the massive hip fins are fully mobile. They follow every movement so the pack reacts to what you are doing; this saves the energy and allows you to pass tricky sections without losing balance. This pack has 9 of them. 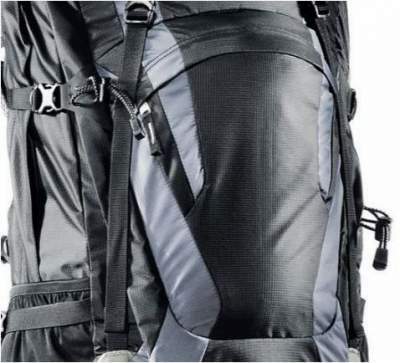 Two zippered pockets are on the hip belt and two mesh pockets are on the sides, for water bottles or for any elongated objects like a tripod; whatever you put there will be fixed in place with the straps. But this pack also has the upper zippered side bellows pockets which are rare nowadays. Their design is such that when full they do not take much volume of the main compartment, they expand outwards instead. The lid is with one pocket with external access, and one pocket is underneath the lid. I have already mentioned the large stretch mesh pocket on the front. The pack is with dual compression straps on the sides, the lower are with the inside-out design. You have all necessary ice axe/trekking pole loops on the lower part on the front. There are also 4 attachment rings on the lid where you can put your solar panel or fix any other piece of equipment. I have already mentioned the bottom compression straps. They use 210D nylon as the main fabric, and PES 600D at more exposed areas. Did you know that it was Deuter company who introduced nylon as the fabric for the first time in the backpack building industry? This was in 1968, see more here. I already mentioned that the frame is steel, so more durable it cannot be. The mentioned PES is a mixture of 35% polyester and 65% nylon, and it is with a PU coating. So you have it on the bottom and when you drop the pack in the snow the things inside the bottom compartment will not get wet. The pack comes with the rain cover, so this is something essential for me and it adds value to this pack. It looks expensive but is it really? The inner divider is with a zipper. But this same design makes two completely separated sections and small items cannot pass from the upper compartment to the lover like in some (even top class) packs where you have an almost useless shelf attached to the walls with 4 toggles only. So I think I am willing to accept this extra weight. This pack comes with 2 extra bellows pockets on the sides. This implies extra material plus two extra zippers. But again, I totally love this design and these pockets mean a lot and keep me organized. I always keep the same things in the same pocket, so when I need them I know where they are. For example, my MSR PocketRocket 2 stove plus a gas canister, and my coffee maker (a sport version of my Bialleti pot which I also carry sometimes, see it in one photo here) are always in one of these two bellows pockets; and yes they all fit there in one single pocket. 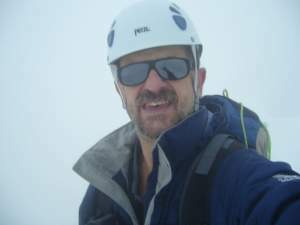 You have the rain cover, it adds a few grams, but I would not consider going into the Alps without it. Did you see the 600D fabric? You have steel frame here, this will last forever. I would not change it for a lightweight plastic. Have you seen this massive hip belt padding? This is for comfort, so I do not mind it; would not exchange it for a thin and lightweight mesh which you see for example in the new Osprey Exos and Eja packs. As of the moment of writing this text, the Amazon price for this pack is $230. So this looks expensive, but think about the included rain cover plus all the quality and features here. This pack is built to last for many years. My own old Futura looks intact after 15 years of active use. Best use: trekking, hiking, backpacking, mountaineering. Weight: 4 lb 9 oz (4.56 lb; 2.07 kg). Volume: 3050 + 610 in³ (50 + 10 L). Dimensions (H x W x D): 30 x 13 x 13 in (76 x 33 x 33 cm). In the table below I give this new Futura Vario 50 side by side with two new models from some other brands. There are big differences in the design but this is the point, I wish to present you a variety of different options. Now, compare the weight and then compare the features and you will realize that the weight of the Deuter pack is completely justified, it offers far more than the other two packs. On the other hand, it is far more expensive than the Kelty’s pack, but it is also far more affordable than the Stein 62 pack. Please follow the links in the table to see more. In the conclusion of this new 2018 Deuter Futura Vario 50 + 10 Pack review, I think it is clear that the pack has been improved in several details. Though it looks a bit boxy and rectangular to me but this is not so important, it remains a very reliable and quality tool. I have trust in the brand behind this pack and I can fully recommend it, I have been using Deuter packs for more than 15 years already. But if you have a chance to buy the previous version with a good price tag, do not think twice, this is a great pack. 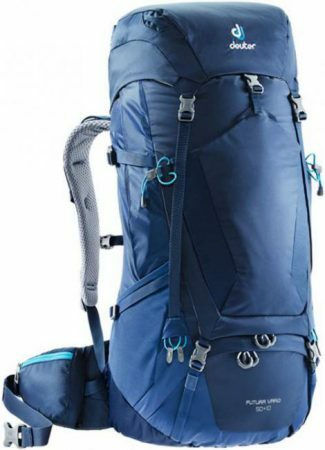 I have included this pack in my list of the best backpacking packs for men. 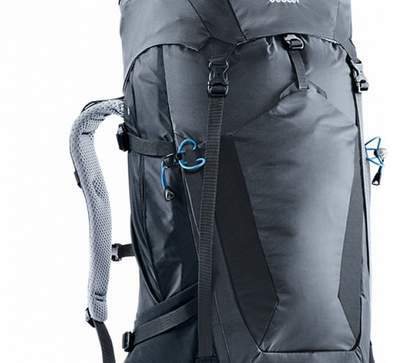 You might want to see how this pack compares to Deuter Futura Pro, so check this comparison text. Note that they have also a version for women, the Deuter Futura Vario 45 + 10 SL; the letters SL indicate ‘slim’ design, so this is also for people with a smaller body size, in particular teenagers. This year they have launched also a new Aircontact Lite series, so check this Aircontact Lite 65 + 10 pack if you need something bigger. 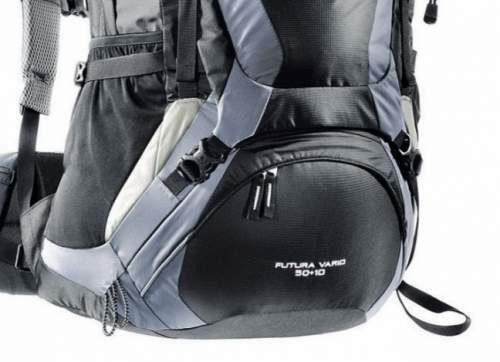 I have made a comparison between these two series so have a look here, my conclusion is that the Futura Vario is a better pack. 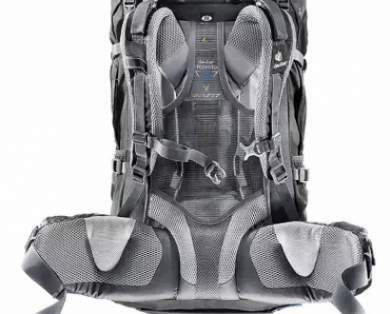 You might want to check my text Osprey Atmos AG 50 vs Deuter Futura Vario 50 + 10 where I compare these two great packs. It appears that the Deuter’s pack has some advantage. Tell me what you think. If you still feel you need something different, please visit my pages with packs in the range 35 – 55 liters, and 56 liters plus, all top brands are presented there in detail, so you will find something for y0u. 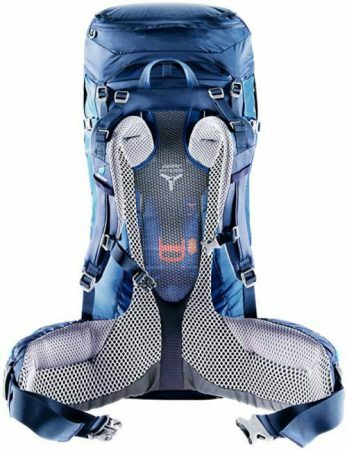 For example, if you want something much lighter (and with fewer features) and more affordable, check this Mountainsmith Scream 55 pack. In the case of questions and comments please use the comment box below. HI! In this backpack, can I put on the bottom of the outside, my tent hanging? Hi, you have seen compression straps over the bottom compartment, they are for this purpose. An alternative is also to put it under the lid which is height adjustable so you can firmly fix it in place. There are attachment loops also on the lid where you can attach it with a cord.